Today, 25th May, Paul Weller, the British lyricist, singer and guitarist of The Jam and The Style Council celebrates his 60th birthday. A Kind Revolution, Weller's thirteenth studio album was released last year in May. Genesis wishes him a very happy birthday. Genesis has worked with Weller on a number of stunning titles including, Into Tomorrow, a visual chronicle of his 22-year solo career annotated with his own text captions, which retraces his steps alongside 800 mostly unseen images by friend and photographer, Lawrence Watson. 'A lot of water has flowed since then, and like any rollercoaster I've gone up and down through the years. It keeps it exciting...' - Paul Weller, looking back on his early solo career. 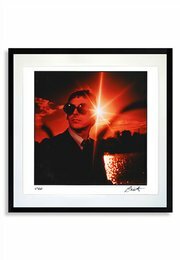 Genesis has also published Paul Weller's Into Tomorrow Portfolio, which celebrates his entire solo career with 12 beautiful, signed art prints. To find out more about Into Tomorrow, click here. To find out more about Into Tomorrow Portfolio, click here.